For the second consecutive year, college students from several private institutions may receive $1,500 scholarships for their professional practices in qualified internship centers through the “Work Warm-up Scholarship Program” sponsored by Banco Santander, the Puerto Rico Board of Education, and the Association of Private Colleges and Universities. The program, organized by Universia Puerto Rico, has a total of $210,000 available to benefit a maximum of 140 students with a grade point average of more than 3.0, who are in their third or fourth academic year and demonstrate financial need. Students conduct professional practices of 240 hours in their respective areas of study in diverse business sectors and industries. In the first edition of the initiative, some 120 students benefited, and 48 internship centers and 10 universities participated in the program. Students gained work experience in areas related to: insurance, health, education, accounting, human resources, sales and distribution, among others. In a survey to evaluate the program both university and employers expressed a 100 percent satisfaction rate. The goal of this alliance is that students acquire professional experience during their college so they can insert themselves more easily into the labor market once they graduate. 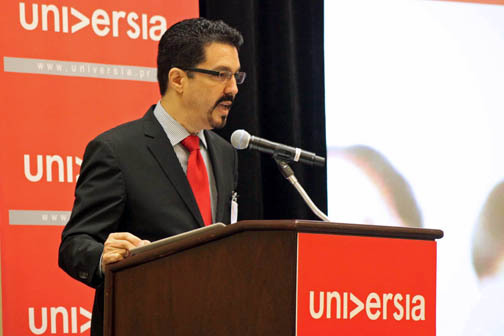 “This program allows college students —through a real work experience — to develop security, confidence and be better prepared for finding employment after graduating,” said Universia CEO José Miguel Justel. Employers who are interested in becoming internship centers may contact Mr. Omar Hernández at 787-281-3540, while students who wish to apply for the scholarship can register HERE. Hey Buddy!, I found this information for you: "Universia announces scholarship program for students". Here is the website link: https://newsismybusiness.com/universia-announces-scholarship/. Thank you.